Many of my favorite trees blossomed in early spring and their pretty petals blew away long before the summer solstice. But no matter the season, there is always beauty blooming somewhere, whether it be by nature or human hands. Just behold the bloom bracelet cuff that recently grew in my handmade trove! You may recognize the handstamped style if you've strolled through my garden of blog posts. The beautiful leather cuff is crafted by none other than Dzign by Jamie. The leather is embossed with a decorative floral design and dyed black. 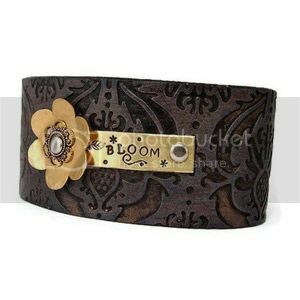 A hand textured brass flower and plaque is riveted to the bracelet. The hand stamped message not only describes the fabulous flower, but also motivates me to continue to grow my creative talents. Sometimes I get weeded when trying to write or draw and need a reminder that hope is not lost. If I keep struggling forward, even better art is bound to bloom. Disclaimer: I received this bracelet as a thank you gift for hosting a free jewelry giveaway. If you think your handmade creations would harmonize with my whimsical ramblings, learn how to sponsor a giveaway here. Hi I'm Sian from http://janesapple.com. I found you on Etsy and have just followed you on Stumble Upon and liked several of your pages. Gorgeous blog. Thanks for pointing me this way on Etsy.